Originally from Toronto, Canada EH?, Amanda has turned in her snow skiis for something a little more tropical. Arriving here on Roatan in 2009, she has made Roatan her home and has indulged in her passion for fantastic diving here in paradise. 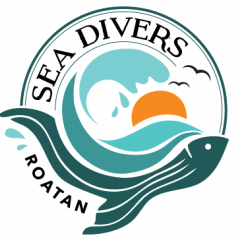 Sea Divers is the second dive shop she has owned here on Roatan and is well versed in what pampered diving is all about for her guests. The former PADI Divemaster / Instructor is not in the water as much anymore as her two children, George and Amelia, keep her more than busy on the surface. You'll find her around the shop and just as excited to hear what you've found on your dive as she would have been to find it herself! Our resident Traditional Handline Fishing Instructor will show you the ins and outs of part of the island's culture whenever you book one of our fishing tours. Born on mainland Honduras he moved to the island at the age of 6 and fished these reefs as a little boy. He learned a lot from the elders of the community and loves to share his passion for fishing with his guests. As a Dive Boat Captain, he is the one of the best in the business. You'll never meet a happier, more hardworking guy in the industry. A professional behind the wheel, he knows the sites and safety regulations within the marine park. If you are snorkeling off the boat he will jump in with you and show you the reef or help you if you are a little nervous. Josue comes from Mainland Honduras and has been working as an instructor and dive master here on Roatan for about 7 years. He has worked all over the island and has an extremely vast knowledge of dive sites on both the North and South sides. He speaks both English and Spanish and you can see by his smile that he absolutely LOVES what he does. He takes his time to teach in a relaxed yet thorough way and will be more than happy to answer any questions. As a guide he likes to go slow and really enjoy the life the reef has to offer. In his past life Josue was actually a LAWYER who turned dive professional and traded in his shirt and tie for a wetsuit. How awesome is that?! Denis was born and raised on Roatan and is so fortunate to call this paradise his home. He is a fantastic Boat Captain specializing in dive site location, weather conditions and diver safety. If you have signed up for one of our snorkeling tours you are in luck! Denis will jump in the water with you, show you all the cool things the reef has to offer and will even hold your hand if you get a little nervous. If you want a real treat you should sign up for one of his special night snorkels! You will see him buzzing in and out around the dive shop as he likes to keep busy and to top it off he makes a really mean cup of coffee!!! YUM!